Each week, we will rank the 32 NFL teams from the best to worst based on their prospects for the rest of the season, so we can see who is looking stronger as the campaign progresses and who is falling down the ladder. The Patriots had a week off but will have enjoyed the results as the Jets caused a surprise by beating Buffalo and Miami lost again. Their position in the AFC East was strengthened. The Eagles were inspired against the Broncos and new running back Jay Ajayi scored a long touchdown. These are good times in Philly and wins in their two games against Dallas should see them to the NFC East title. 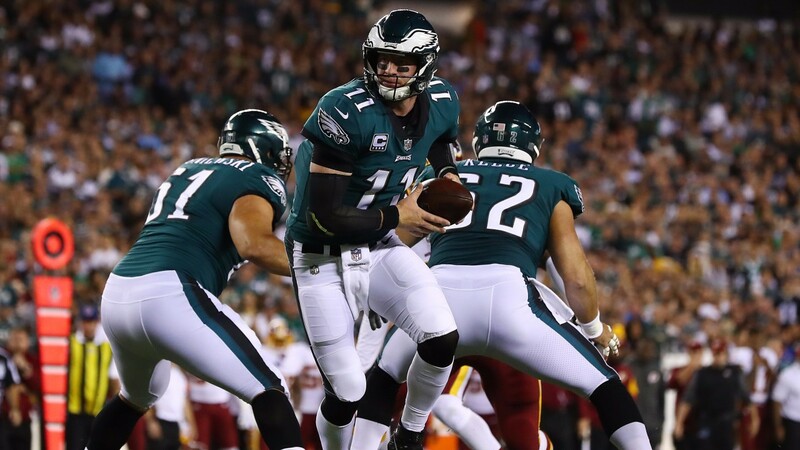 They have slipped down one after the Eagles thumping win but they should soon be in their stride against the Colts. Defeats for Baltimore and Cincinnati in the Steelers' bye week means the Steelers are firmly in control of the AFC North. Others lost their opportunity to make up ground so the Vikings are still on the rise. They are still two games ahead in the NFC North and ideas of making a home Super Bowl appearance may not be that fanciful. Three defeats in four games have seen the Chiefs slip down the list and their bye week has perhaps come at a good time. They need to regroup, although the standard of the AFC West does not look strong this year. They should still win the division. Defeat to Washington was a setback after four straight wins and they cannot afford to slip up with the Rams in such excellent form. Games against the Rams, Philadelphia and a trip to Dallas remain on the schedule. While the Cowboys are still waiting on news of Ezekiel Elliott's possible suspension, they look set to push the Eagles all the way. They have scored at least 28 points in each of their last six games and remain a tough match for anyone. Six straight wins have the Saints dreaming of their first Super Bowl success since 2010 with a much-improved defence this season. None of their remaining games will be pushovers but they are the team to beat in the congested NFC South. The Falcons have lost four of their last five matches and last year's best offence have failed to score more than 17 points in any of those defeats. They still have five divisional matches to play, though, so much could change. The Panthers offence is not firing and they look weakened by the departure of wide receiver Kelvin Benjamin to Buffalo, but a couple of divisional wins in their last two outings could come in handy and their defence is solid. The Titans have won their last three games, but the quality of those is tempered by the fact they were against Indianapolis, Cleveland, when they limped over the line in overtime, and Baltimore. Tougher tests are around the corner. Having had the week off after blitzing the Cardinals at Twickenham, the Rams brushed aside the Giants with powerful displays on both sides of the ball. What a difference a season makes. The Raiders got back to winning ways but their inconsistency should be addressed during their week off. With games against New England, Kansas City, Dallas and Philadelphia to come they look to be up against it. The Jaguars put up another good defensive performance against Cincinnati and are right in the mix for the AFC South. Rookie running back Leonard Fournette could be spurred on by being benched last week for indiscipline and they need that to happen as questions about QB Blake Bortles remain. A rare win in Green Bay, even though the Packers were without Aaron Rodgers, should be a big boost for Detroit. The Vikings are the only team they have left to play with a winning record, so they could get on a roll. The Packers were unable to galvanise themselves during their week off following the loss of Rodgers and it is difficult to see them getting back in the playoff picture without their star quarterback. The return of Brock Osweiler didn't do the trick as the Broncos were crushed by Philadelphia. Improvements have to come quickly and it would be a surprise if they happened this week. Their prospects look gloomy. Just when it seemed the Bills were going to make a push, they slipped up against the Jets. Their fixtures look tough and while four remaining divisional matches give them a chance, two of them are against the Patriots. They are not out of it though. Their win against Seattle shows Washington are capable of beating the best teams on their day, even without star tight end Jordan Reed. However, a poor divisional record means they are likely to struggle to be a factor in the NFC East. The Bucs have lost five straight games and quarterback Jameis Winston is injured. Receiver Mike Evans is banned after displaying a terrible lack of discipline in last week's defeat to the Saints. They are heading in one direction. The Cardinals recovered from their Twickenham thumping by the Rams by beating the 49ers. But then everyone is beating the 49ers. Quarterback Drew Stanton is likely to face much tougher tests, starting with the Seahawks. The Ravens won their first two games against Cincinnati and Cleveland, but they haven't strung two victories together since. They seem to lack the consistency to give their arch-rivals the Steelers a run for their money. Monday's defeat against the Raiders was only the second time this season they have eclipsed 20 points and they don't look like making a charge under quarterback Jay Cutler. The departure of running back Jay Ajayi could come back to bite them. The Texans hopes seem to have been extinguished by rookie quarterback DeShaun Watson's knee injury after Tom Savage struggled against the Colts. Houston's baseball team won the World Series but a double celebration looks highly unlikely. The Chargers can still be tough opponents and they have plenty of winnable matches remaining - after this week, only Dallas and Kansas City have winning records - so they could have a strong finish. However, they have to get going quickly. Victory over Houston by stopping their late drive was a welcome boost for a team whose season was fading away. It would be a big surprise if they became a factor in the remainder of the season, though. The Jets continue to shock people, although they were excellent in their victory at Buffalo. Maybe they could emerge as the Patriots' chief rivals in the AFC East, but doing much more could be a big ask. They were tipped to struggle, so they have nothing to lose. The Bears would not have thought they would be chalked up as favourites against the Packers a few weeks ago. Quarterback Mitchell Trubisky will have probably enjoyed the opportunity of a bye week after a couple of quiet matches, so there could be further improvement. The Bengals offence came up short again and they continue to struggle. They have scored more than 20 points just twice and they are slipping out of contention. Brushed aside by the Rams, the season is turning into a disaster for the Giants. Injuries have not helped but they won't want to think about losing in San Francisco. They are playing for pride now. Last week's clash with Arizona looked a good opportunity to gain a win and the Giants provide another decent chance. Some of their defeats have been close but it is beginning to look like they are going backwards. There has been a chance for reflection in Cleveland during their bye week and there were early signs of encouragement in their defeat to Minnesota at Twickenham. But getting a first win on the board doesn't look likely this week.